The LC-32L400M 32" Multisystem Widescreen LCD HDTV from Sharp is the perfect pick for an excellent quality and reliable multi-system LCD HDTV. 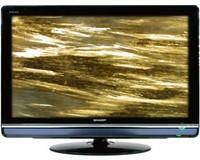 At a reasonable price, the LC-32L400M is a true find amongst other competing multi-system LCDs on the market today. Boasting 1366 x 768 resolution and the optical picture control, the unit enhances clarity and expressiveness of black colors, providing more realistic pictures with fine gradations for movies and other video content. Speaking of movies, the LC-32L400M also includes a 24p True Cinema mode. This cool feature allows films to be watched at home with a faster play-back than at the cinema.